Now available from John Morris Scientific , Julabo CF series compact refrigerating and heating circulators are small enough to be used within complex installations. These cryo-compact circulators have working temperature ranges between -40 and +200 degrees celcius. A maximum ambient temperature of 400 degrees celcius and force ventilation air cooling ensure performance even when the circulator is closely positioned between other instruments. 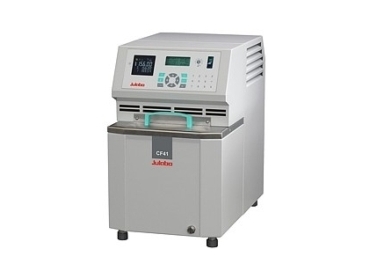 All units offer heating capacity of 2kW and depending on the model, cooling capacities up to 470 W.
All Julabo CF series refrigerating and heating circulators feature pump connections for external temperature applications and a bath opening for temperature control of small objects directly in the circulator bath. Wetted parts are stainless steel or plastic. The CF series provides microprocessor electronics with high-temperature stabilities, as well as warning and safety functions. The high tech controller versions offer free programmability and have interfaces for data communications or external temperature sensors.